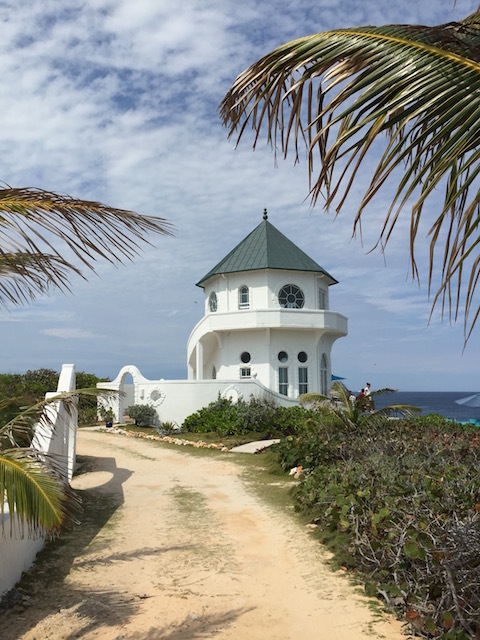 This week we visited – long overdue – Ocean Tally – the latest place to feature in the Best of Eleuthera series. 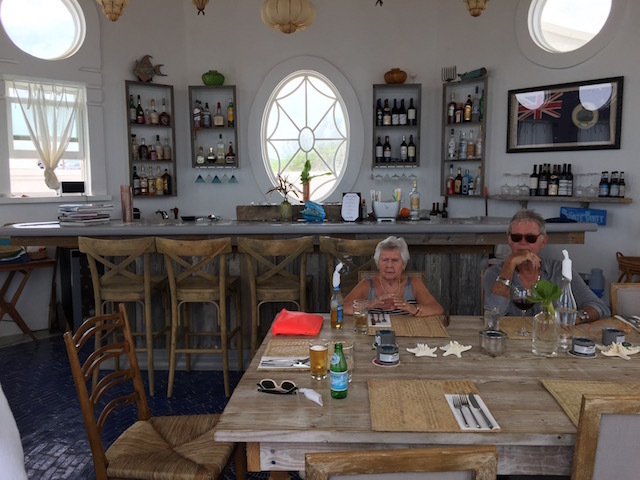 We had a long and leisurely Sunday lunch at the dramatically sited restaurant right up at Whale Point in the north of the island. There are 3 cottages at the moment with plans for another 3 coming soon. 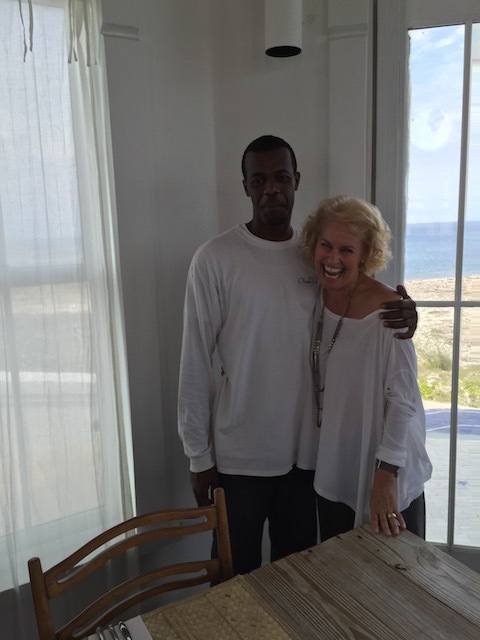 I chatted with Bahamian owner Annette Farrington-Young whilst sitting at the large dining table in the restaurant. It has been operating for several months. It is open for lunch from Thursday to Sunday – you do need to book as space is limited inside. They open at night – also from Thursday to Sunday for private dinner parties – call for details – but usually for parties of 10 – 12 people although they can cater for up to 24 – 30. 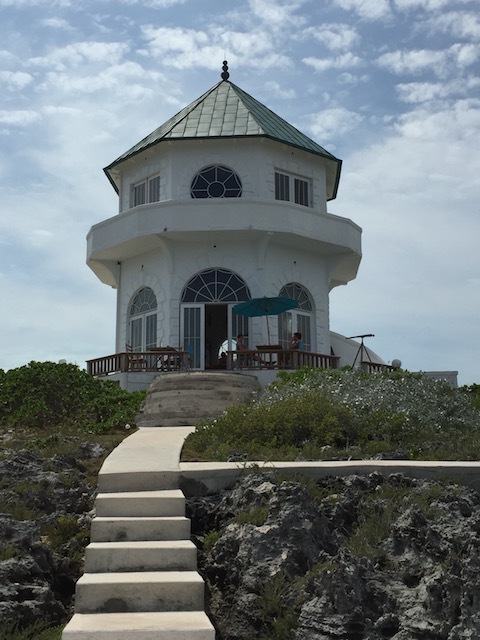 Whale Point is very close to the southern tip of Harbour Island and many visitors to Ocean Tally come across by water taxi which Annette is happy to arrange with a local captain. They have a secluded beach at Bottom Harbour for the use of guests as well as the dramatic natural salt water pool down on the rocks facing the Atlantic Ocean. The concierge service there includes arranging snorkeling and boating trips both for sight seeing or deep sea fishing. However if , like us, you are driving up from the south then turn off to the right just after the Glass Window Bridge – follow the sign to Ocean Tally – it is quite small and discreet but just keep going along the bumpy little road that leads there – it takes a good 5 minutes once you turn off Queen’s Highway. You will know you have arrived when you see the big white circular entrance arch – then park and make your way to the two story building that houses the bar and restaurant. There is plenty of space to eat outside as well as the indoor dining and bar area. The decor is elegant and stylish and artwork by Annette’s husband the artist Stephen Scott Young is in both the bar and the cottages. 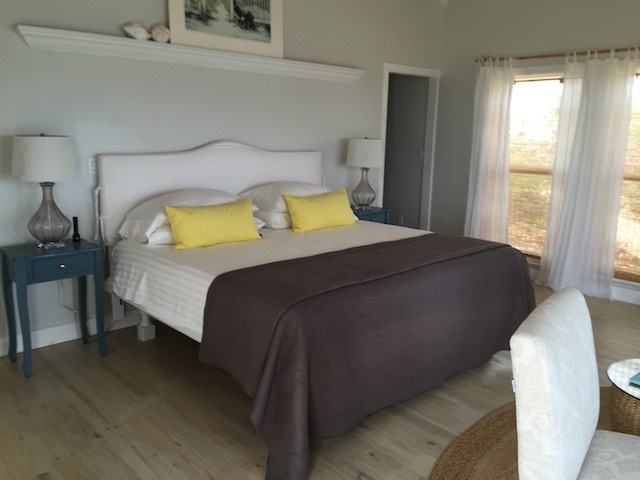 The cottages each have a king size bed and beautiful bathrooms along with a mini bar fridge and Nespresso coffee makers – and spectacular views of the Atlantic Ocean….. They have a very calm and relaxing feel – colors are subtle and there are many small, delightful original touches. 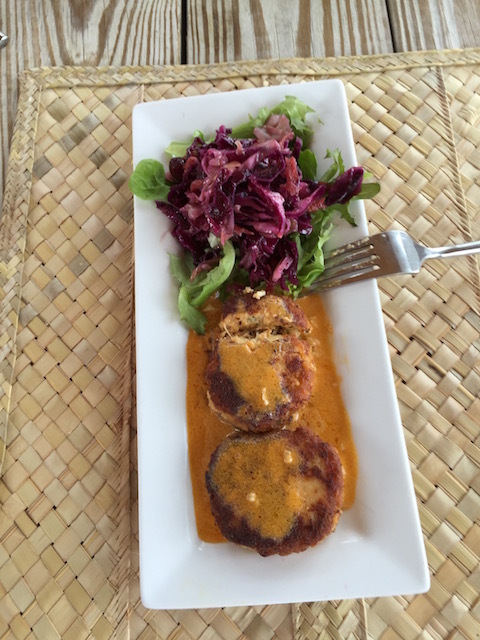 Shrimp and grit cakes with tequila sauce….. The food is fantastic and we ate plenty to make sure ! The chef is Bill Stack who previously worked in Nassau. I didn’t get to meet him on this visit – which is unusual for me – but I will I’m sure. His menu is imaginative and perfectly executed – he is a very talented man …… OK so now down to the nitty gritty of what we ate ! 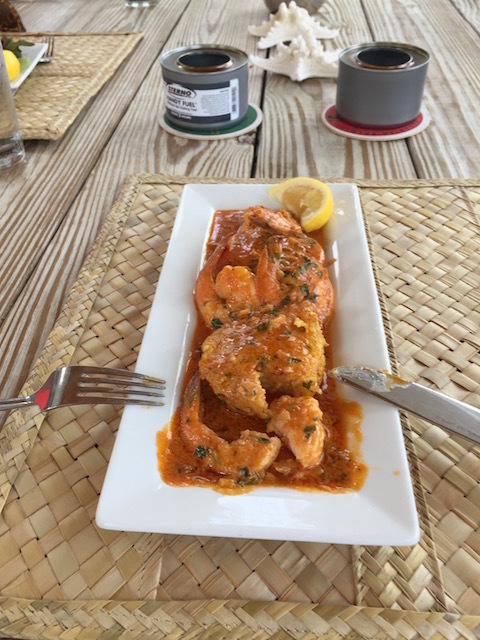 Bob and I both had shrimp with a tequila sauce served with grit cakes – sensational and very popular from what we heard. Mum had crab cakes with red cabbage coleslaw – I had this as a main course. 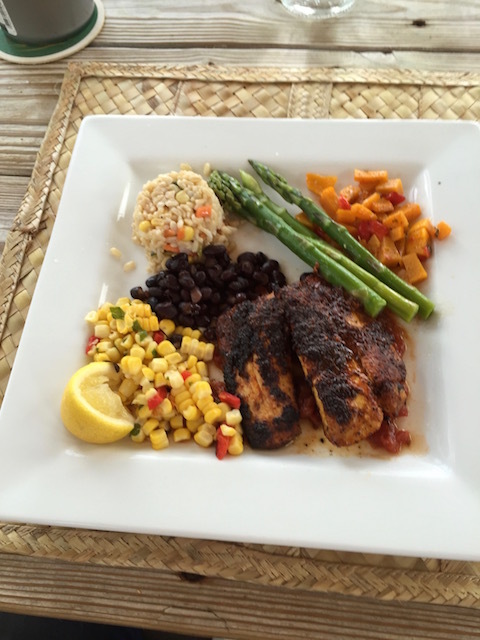 Bob ate fresh caught mahi -mahi – served with perfectly cooked asparagus, black beans and a sweetcorn salad. 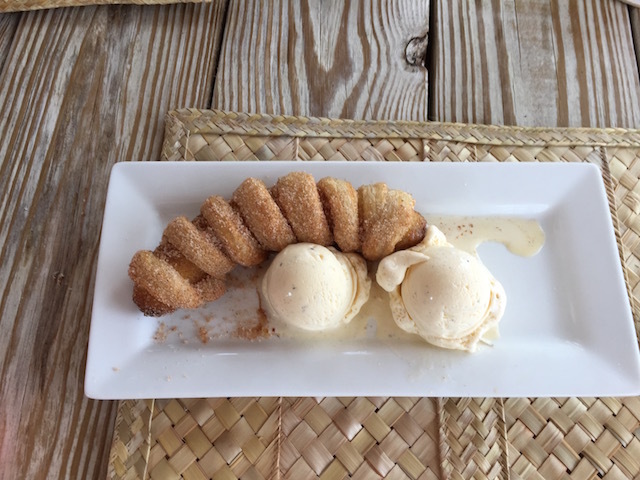 Finally we tried the Banana Tally served with vanilla ice-cream – dangerously good – it is a banana wrapped in pastry ! Banana Tally – dangerous !!! The staff are very friendly and although the restaurant was very busy managed to be attentive and efficient. I am so pleased that we have found this wonderful addition to the island and will continue to enjoy eating there. It is a good distance from Governors Harbour but well worth the journey – try it for yourself and see ! Seabreeze and I went there in December. He regaled me with stories of what it was like there when he was a boy. That was a few years ago. The view is spectacular so I advise going there before the sun sets. The fare was excellent and good chat with the nice bartender. Looking forward to going back soon. We have had lunch there a couple of times and it is wonderful. The food delicious, staff attentive, and the view is unbelievable! So lucky to have another great place to eat….. Thanks for your comment. Yes – the bumpy ride makes arriving there even more of a pleasure ! Absolutely love the big Ocean there, magnificent. Food was great, tequila and shrimp, ingenious. A true gem of the island. I loved seeing this article! 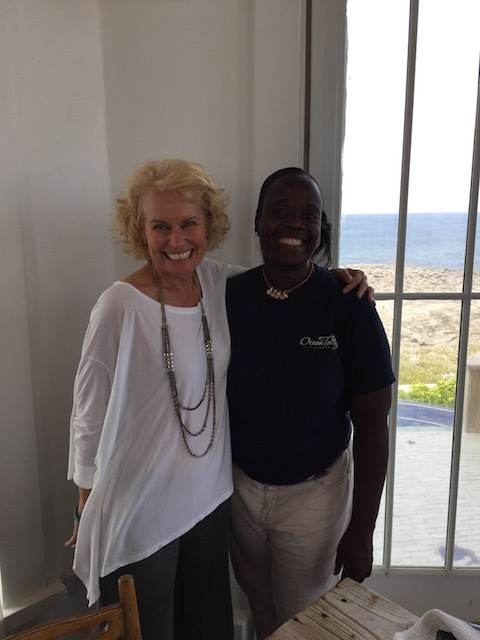 We had such a wonderful experience at Ocean Tally at Christmas when our extended family was in Eleuthera with us. The food and service was excellent. Annette is so talented! I guess the secret is out now.